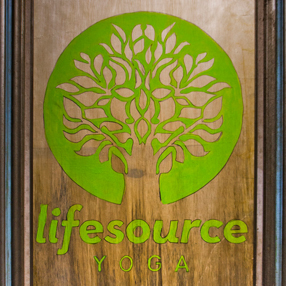 Lifesource Yoga is Akron’s most diversified community yoga studio. To us, yoga is more than an exercise- it’s a way of life. By using the breath to initiate and accompany traditional yoga postures (asanas), you, the student, can find a path to inner peace and spiritual wellness. With regular practice, you can expect increased strength, flexibility, toning and lengthening of muscles, and improved physical fitness. The most beneficial aspect of yoga may be the mental and emotional calm and clarity you will achieve as a result of your practice. Leave the past behind… avoid anticipating the future… and focus on yourself in the present moment. Achieve harmony and balance with the world around around you! Join us at Lifesource Yoga for the class that is right for your present needs and physical, mental, and spiritual aspirations. We offer a wide variety of classes, bodywork resources, and workshops for individuals of all ages and experience levels. Gentle and Restorative classes nurture the body and allow students respite from the often frantic pace of everyday life. Yoga Basics and Alignment-Based Yoga classes focus on proper alignment and the physiology of yoga to impart students with a deep understanding of the asanas being practiced. Slow-Flow classes use the basics of Yoga Basics and increase the flow-speed and rigor to help the practitioner work up to a Vinyasa class. Vinyasa, Intermediate, Power Vinyasa and Ashtanga classes are designed for experienced students desiring a rigorous, cleansing, flowing class in a warm to hot room. Special-focus classes are also at the heart of our studio. Prenatal classes create a simple and safe practice for mothers-to-be and new mothers. A variety of classes for children are designed to teach postures, breath, and relaxation to children ages 3-12. Our newest addition, Feldenkrais Method: Awareness through Movement , helps students experience relief from strain, injury, habitual tension, and other challenges to reach an improved way of life. Schedule a massage or reiki meditation session to specifically target your physical restrictions and open healthy energy channels in the body and mind. Additionally, Lifesource Yoga teachers take their classes off-site to reach the needs of those whose circumstances are best met in their own location. Our Lady of the Elms and Old Trail School offers youth grades K-8 yoga classes in their after school programs, teachers volunteer their services in local classes for a variety of non-profit organizations. We also offer periodic, reduced-cost, community classes to benefit area arts organizations and other non-profit community & educational organizations. We are constantly looking to offer yoga to everyone, regardless of ability level, prior knowledge, physical condition, or socio-economic level. At Lifesource Yoga, we believe in the benefits yoga can bring to you; we welcome you to visit anytime! Lifesource Yoga is my personal getaway from the everyday burdens of my life.